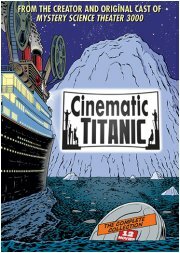 Movie: "Cinematic Titanic: The Complete Collection"
Plot: A group of riffers are drafted to watch and riff on bad movies for some sort of scientific purpose. Review: It's taken years to assemble all the missing pieces of the MST3k legacy, and now we have one gigantic chunk in a single massive package. I hesitate to think of where the franchise would be without the good folks at Shout Factory. As with the MST3k collections, your mileage may vary based on the spread of riffed films. 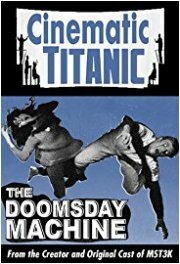 One of my personal favorites is East Meets Watts, while Doomsday Machine manages to be so powerfully dull that even a team of trained riffers is hard pressed to keep you awake. Thank goodness you have the entire series to choose from, including the previously-released live recordings. I wish they could've included all of the other live shows, notably missing is Samson and the Seven Miracles of the World, but unfortunately the crew didn't have the foresight to film them. As for the show itself, I always wished Trace and Frank had recorded more riffing-related content, so it was good to have them doing it again. I was less excited for Joel as his style always seemed a bit bleary-eyed and soft for my liking. Also, as small a thing as this might seem, I found it slightly distracting to have them onscreen as silhouettes on the sides of the screen in every episode. I know that seems like an odd criticism for a show coming from a tradition of riffers being onscreen like that, but watching them shift around from having to be on their feet for ninety minutes takes away from the awful movies you're supposed to be watching. One of my biggest complaints about the new MST3k is that you can tell there's way too many writers working on the show because of how jokes are crammed into each scene and read as fast as possible. 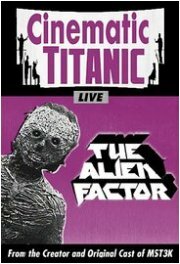 I thought Cinematic Titanic would suffer the same problem having five riffers on stage at once, but they managed to pace everything out nicely without it feeling like everyone had a quota of jokes to get through. It's too bad the show is over, but you can still see most of them in either Rifftrax or the new MST3k. And on the bright side, now you can binge watch the entire series!